Start of the June in Ramadan, Aalii People wanted their blog ready for the posting in this summer. They had variety of ideas to put in the form of blogging but no idea whatsoever how to. From explaining the basic blogging stuffs to coding the final footer of the blog. I would say it was the most convivial and challenging task I did as my first official custom design project. And I'm thrill to reveal all the scenes we've gone through in a month long of brand and blog development process. Majority of White, little chic, slightly girly, modern and contemporary with ubiquitous colors and here’s how we made that happen. The design process started from creating the mood board and pinning the materials there, themes, colors, inspirations, design, layout - everything. Me and Sanna both collaborated on this task and it really helped us to get on the same road and communicate on our thoughts/ideas and most importantly project never got off the track. In the end, I pulled all the images that best fit the Aaliilogue style and then the colors out of that final mood board - Iris Blue and Dandelion Yellow taking the lead along with soft pink to splash a little chic and dainty feel. Our direction was to come up with clean and fresh look, so my main focus was to pick subtle colors that match with the style while the design being not too harsh. Luckily, she has the same love for minimalism as I have. So I really enjoyed working along and making decisions with her in that phase. When our vision was all set, we moved on to the brand creation process, for this Sanna had few ideas in hand which she wanted the logo to be look like. But in the end she wanted modern and cursive style for the typeface in the logo. So I had to come up with the custom calligraphy, for this I roughly sketched few doodles to bring the idea into action, which turned out to be her favorite style. When approved, I finally digitized it. For categories Sanna drew custom doodles using Paper 53 App (designed by team Fifty Three) which she uses in creating Doodles for her Badges and Magnets, to fit each topic then I put them together and colorized it up to fit with the brand style. You can notice them in action over the sidebar area on the blog. Once we all settled on logo and visuals, I started working on Blog's elements, design and development. Last, but not least, We worked together on every bit of this project and I enjoyed every moment of creativity that have gone into every detail of development. Here's what Sanna is talking about her experience. 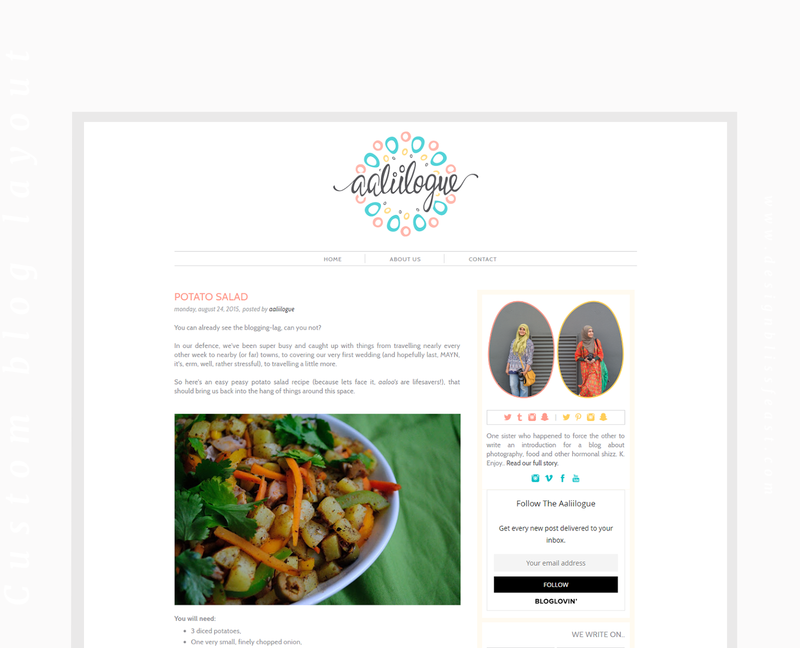 I'm honored that Sanna trusted me for her Brand and Blog Design and we both are thrilled with the final result! 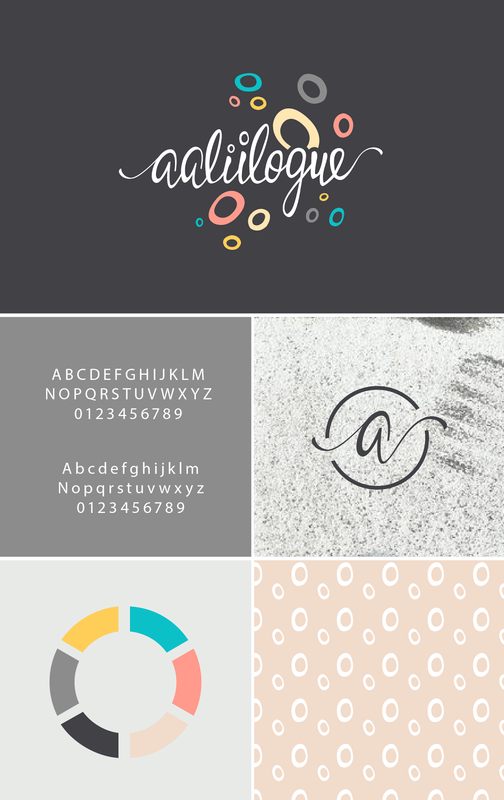 What do you think about the visual identity of Aaliilogue? Leave your views in the comment. This project is designed and developed on Blogger blog. | Moodboard images sources: 1, 2, 3, 4, 5.